Yesterday we invited my grandparents for a simple lasagne dinner: A vegetable Lasagne with roasted tomato sauce. All fresh veggies, roasted, marinated, nice herbs and a gorgeous cheese sauce, enhanced with an egg in the bechamel. This is a slow cooking dish - so count 2 hours to get it done. 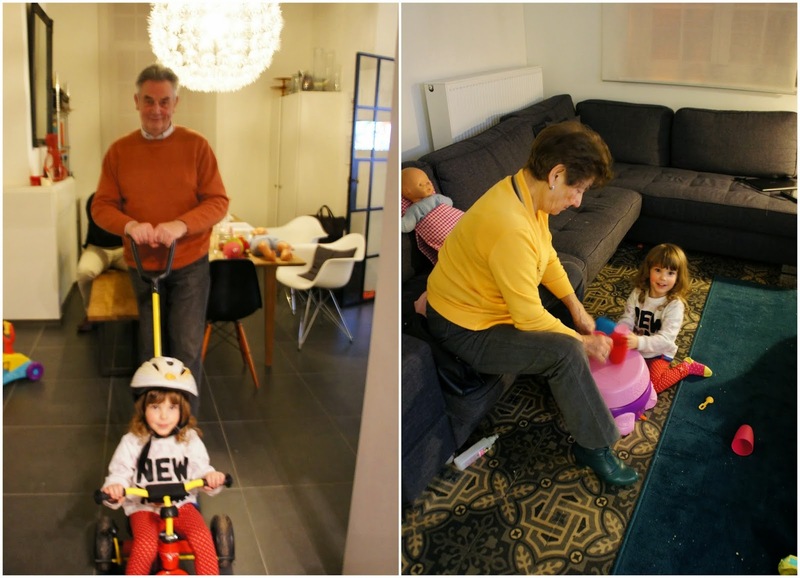 My grandparents are still young at heart and enjoy playing with Olivia. Olivia enjoys playing with them too and she made 'bumpa' drive her around on her bike for ages. But he is happy to oblige. 2. For the roasted bell peppers; Place peppers and olive oil in a large bowl, season with thyme, salt and pepper. Place cut side down on a baking paper-lined oven tray and roast for 20-30 minutes or until blistered. Transfer to a bowl and cover tightly with cling film. Stand for 5 minutes to loosen skin. Peel and discard skin. 3. For parmesan cheese sauce; Melt butter in medium saucepan, stir in flour; cook stirring for 1 minute. Add salt and pepper and gradually add milk, whisk until slightly thickened. Remove from heat, cool slightly. Add parmesan and ricotta and mix through. 4. Stir in egg until combined. Season to taste. Cover with a round of baking paper so a skin doesn’t form. 5. Preheat oven to 140°C. 6. For roasted tomato sauce; place quartered tomatoes, skin side down in a roasting pan, drizzle with 20ml olive oil and scatter with oregano, margoram, salt and pepper. Slow roast for 1½-2 hours or until slightly dehydrated. Cool slightly. 7. Heat remaining 20ml olive oil in a saucepan; add onion, garlic and a pinch of salt and cook over low heat for 10-15 minutes or until onion is translucent. 8. Chop tomatoes into 5mm dice, add to onion mixture with any juices and cook over medium heat until sauce is slightly thickened. If too thick add a little water; pass through a moulis or sieve to remove skin and seeds. Check seasoning and consistency, add a little extra olive oil and some pepper if desired. 9. Place eggplant in a colander, toss with 5g sea salt and stand over a bowl to drain for 30 minutes. Rinse under cold water and pat dry. Brush both sides with a little olive oil and sear in a hot frying pan 1-2 minutes each side or until golden and tender. Remove to a board. 10. Brush zucchini with a little olive oil and sear on both sides in the hot pan until zucchini is golden and tender. Remove to board and trim vegetables to fit dish. 11. Bring a saucepan of water to the boil and cook lasagne sheets to almost al dente. Refresh in iced water and drain well. Cut pasta sheets into rectangles to fit dish. 12. Lightly grease four 2-cup capacity (12x8cm ceramic dishes) with a little olive oil, line base and 2 long sides with a sheet of baking paper extending 3cm above both long sides. 13. To assemble, place a piece of eggplant in the base of prepared dish, followed by a piece of pasta. Spread with parmesan cheese sauce, then top with a piece of roasted bell pepper, then top with about 2 strips of zucchini, then a piece of roasted bell peppers, followed by another pasta sheet, then parmesan cheese sauce and finally place another 2 strips of zucchini. Fold baking paper over and cover with foil. 14. Repeat this process with the remaining lasagne. Bake at 180°C for 20 minutes until lasagne is tender.